Reviews Reviews from the Dark Side Stranger Things #1: Will Byers, Where Are You? Stranger Things #1: Will Byers, Where Are You? 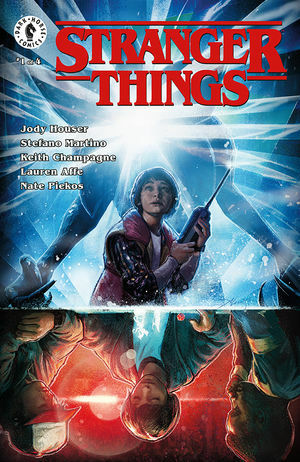 Set in the fictional town of Hawkins, Indiana, in the 1980s, the first season focuses on the investigation into the disappearance of a young boy amid supernatural events occurring around the town, including the appearance of a girl with psychokinetic abilities who helps the missing boy’s friends in their own search. The second season, titled Stranger Things 2, is set one year later, and deals with attempts of the characters to return to normality and consequences that linger from the first season. In that first season, the missing boy (Wil Byers) gets very little story time other than used as the contrivance to move the story along. It worked really well and made for a dramatic story. However, I for one wished that we knew more of what happened to Wil when he was in the Upside Down. This comic is that story. If anyone read the “ashcan” book that was released several months ago – it did not help this book at all. The story in it was confusing and seemed to be pointless. The marketing plan was a failure. However, this book as a whole is a much better add-on to the original story. Jody Houser has written this book. Jody is extremely well versed in taking large franchises and adapting it to the page. Recent examples are Star Wars (the Rogue one and Thrawn adaptations) and more recently Doctor Who. One of the artists, Stefano Martino, is not quite as prolific as Ms. Houser. The art style does work well and certainly does not detract from the atmosphere needed to portray the Upside Down. This book is worth picking up – its almost like the DVD extra that we didn’t have. And should have.